Is this the last session of the year???? Good morning to you, and thanks for stopping by for a quick read. It's been a bit of a race against the new year clock to fit in as much observing as I could before the end of 2014. Not only a race against the clock, but also the brightening moon, and to make the most of this window of clear skies. It has been very cold and clear here in Herefordshire, but each night, more and more low level mist has been appearing because of the lack of wind and temperature inversions being created by the current weather conditions. So, with that in mind, I decided to abandon my permanent pillar mount for the evening, and break out the original tripod, bringing it around to the side of the building. I did this to get better views of Orion and when it comes into view, Jupiter. It was only going to be a short session for the evening, but an enjoyable one nonetheless. First targets were the favourites M42 and M43 in Orion. Perhaps one the most popular at this time of year, it was the first time this winter I had chance to observe them. The nebula was visible, but somewhat washed out through the light mist and light that it reflected. I was still able to resolve the stars within the nebula and spent my time getting familiar with it once again. For reference whilst observing, I was using my Sky & Telescopes Pocket Sky Atlas, in particular the section that looks specifically at this area of Orion, Using this, I picked out the cluster NGC 1981. A bright and pretty cluster next to M42 and M43. Next on the agenda was Alnitak, the first star in the belt of Orion as I looked at the constellation. This is flanked by the Flame Nebula and Horsehead Nebula. However, conditions and capabilities of the night and my scope meant I wasn't expecting to see them. But, while looking at the star using my 8mm EP, was able to resolve a faint star next to it. However, at this point, I am unable to confirm what star that it was. Nevertheless, I was pleased with what I had observed. Sticking in the constellation of Orion, I moved onto M78 which is another nebula. At magnitude 8, it was going to prove a challenge in the deteriorating conditions, but I did manage to locate it. It looked nothing more than a light grey smudge on a slightly darker grey background. So, I decided to leave that for the time being. And finally for the evening, I turned the scope to the East and saw Jupiter as it began to rise up over the horizon, Straight away, Jupiter presented itself in all its glory. The 4 moons, Ganymede, Callisto, Io and Europa were pretty evenly spaced each side of the planet, two moons either side. As the planet was still quite low in the horizon, whilst observing, I did notice periods of high atmospheric disturbance as the planet flicked in and out of focus. I observed the planet using my 8mm and 5mm BST EPs, and though the image was obviously larger in the 5mm, the 8mm give me the better view on this occasion. When the atmospherics allowed, the image was actually quite clear considering. Was was able to make out the Northern and Southern Equatorial Belts with each, but also make out the darker colour in the polar regions. The only thing with observing at such a high magnification is the constant requirement to make amendments to the EQ mount to keep the planet in the field of view. It is still an ambition of mine to see the Great Red Spot on Jupiter, but until we get better conditions and the planet is higher in the sky at a sensible time I think I am going to struggle. Perhaps by mid to late January, I will be able to give it a better go. So there you go. That is possibly the last Astronomy According to MountainMadMan blog post for 2014, unless things prove good for observing tonight. For everyone that has stopped by and taken the time to read my gibberish, and for people who have contributed, thank you very much. I really appreciate it. Here's to a successful 2015! Happy New Year! Cramming in the sessions before the end of the year! Whilst there are indeed improvements in the ski conditions in France, to the detriment of the 10's of thousands of drivers that appear to be stranded on the valley floor, we in the UK are currently under the influence of a stable air mass meaning that conditions for observing are pretty good at the moment. However, there is still a fair bit of moisture in the air, and the weather is cold. I decided on a back yard session, so set my scope up on the pillar and started the first part of the session by around 6pm. I has compiled a list of objects that I wanted to find, but it quickly became apparent that I had misjudged what would be visible from my position. Part of that was to do with time, and part to do with obstructions. Within a few minutes of going outside, frost had already started to for on some surfaces. In truth, back back garden doesn't see direct sunlight at all during the winter so the frost was still hard from the previous night. This was to be a telling sign of what was to come, and ultimately dictate the end of the observing session. 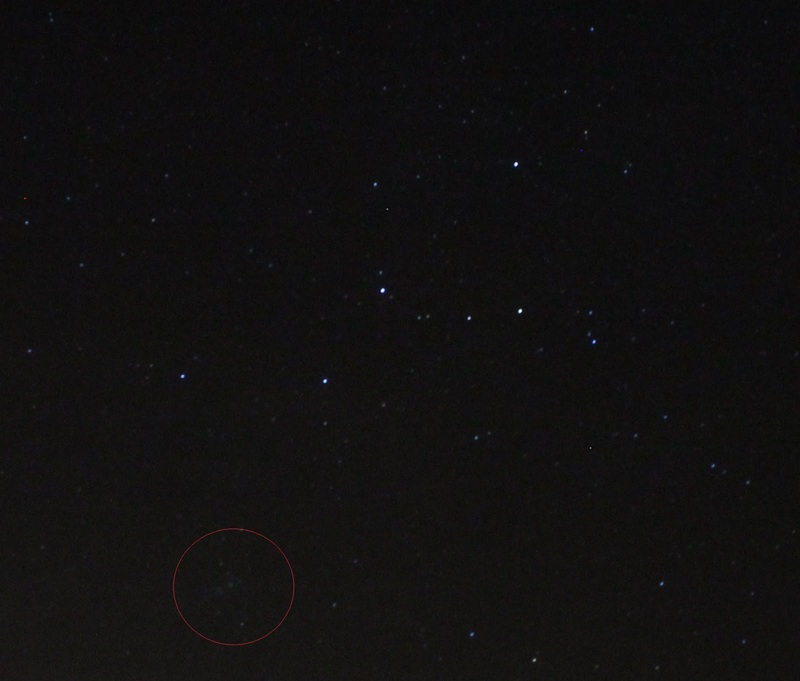 So, my first target of the night was M34, a magnitude 5.2 cluster in Perseus. It's on object I think I have tried to observe before, but hadn't been able to find it. I saw quite a sparse cluster, but with some nice brighter stars throughout. Its been nearly a year since I last observed my last pair of targets. M81 and M82 are a couple of galaxies that appear in the same field of view through my 18mm BST EP. M81 is classed as a spiral galaxy, and though is reasonably bright, I struggled to make out anything more than the basic circular shape of the galaxy. M82 is an Irregular galaxy, also known as the Cigar Galaxy. In recent time, this became well known in the scientific media when a supernova was observed within it. Both galaxies showed up well and it was pleasing to make out the shapes of the galaxies. I'm pleased that I took time to re-visit them. After a bit of a back garden disco courtesy of people switching on their kitchen and bathroom lights, and some animal setting off a neighbours insecurity lights at regular intervals, I decided to head indoors for an hour for a bit of a warm up. When I returned, Castor and Pollux, the twins in Gemini were just rising above the house next door. It gave me an opportunity to take a look at M35. A cluster in Gemini. It is reported to be a naked eye object, but, not for me in the conditions. For me at the moment, Gemini rises up from the direction of Ross town, so there is a fair bit of light pollution in that direction. However, through the scope the cluster was very evident. Filling the field of view quite nicely. Next on the list was M52, another large cluster between the constellations of Cephus and Cassiopeia. Winter is supposed to be optimum time for observing this constellation. I used my 25mm and 15mm eye pieces for this object. Usually, I would expect to see a slight decrease in brightness with increasing with magnification, but on this occasion, it was pleasing that I seemed to loose little if any brightness. It meant that I could resolve more stars using the 15mm, especially when observing with averted vision. Finally, I took the chance to visit another new object for me. I tracked down Herschels Garnet Star. On this occasion, it was a very bright and vivid orange and stood out proudly amongst the white lower magnitude neighbours. It has been noted over history that the colour of the star does change from orange to a deep red colour. It can be found on the edge of the constellation Cephus and is set among a large area of nebulosity. However, I was not able to make this out with my scope. So, a successful session in the end. Next time, I hope to put my scope on its tripod, and move to a location at the other side of the garden so I will be able to start looking around Orion, and, when it rises, Jupiter. I've been determined to get some back yard observing done over this festive period, and then, on Christmas night, I managed to get out for an hour or so. The weather has been mild and mixed of late, with little opportunity to get under a clear sky in this corner of Herefordshire. The forecast for yesterday was good though, so with the main festivities complete, and a night of trashy telly beckoning, I opted to stand outside in the developing frost instead. So, to kick the night off, I opted to first go for M1, the Crab Nebula. Using my Telrad charts, and managed to locate it quickly. I would say that it is at the limit for the ability of my 150mm reflector, but I could make out the nebula against the background sky. However, in terms of detail, well, I couldn't make much of that out at all. However, happy that at least I could identify it, I thought it a good idea to move on. Next I visited Auriga, which is a constellation I wanted to revisit since my last observing session with my friend Jim. I located M36, a cluster with relative ease, and then used the 18mm EP to get a slightly improved image in the EP. I estimated that I could make out approximately 70 stars or more in this cluster. The seeing was very good I think because the view I had was particularly clear. Especially of the stars of higher magnitude. It was a good challenge to spend time looking at this cluster because of eh abundance of stars of all different magnitudes. Next, I turned to my Telrad finder chart of Overlooked Objects, and I picked out NGC 2281 as my next target. In some places, it is also referred to as the Broken Heart Cluster. In clusters and features such as this, it's nice to try and make out where the feature gets its name from. I think I could make out half a heart shape in the small, but pretty cluster. However, I needed a picture to verify what I was seeing was the correct thing. When I returned indoors, I searched for photos of the cluster online and confirmed what I was looking at was correct. However, I'm still not entirely convinced on the 'Broken Heart' name though. Perhaps my imagination just isn't that good! The next object for the evening was a favourite of mine in the constellation of Cassiopeia. The Owl Cluster, or NGC 467 was standing out very well against the black background. The two bright stars that form the eyes of the owl are a great aid to verifying that I was looking in the right place. One of these stars being Phi Cassiopeiae. This is one target that I can certainly make out the shape of an owl with its wings slightly out standing on a perch. As seeing conditions were good, and the atmosphere seemed fairly steady, I decided to got for another target that I knew would challenge the limits of my scope. So, I went to NGC 7789, another cluster in Cassiopeia. Now, initially, in the books, it gives the cluster a magnitude of 6.7, which is well within the ability of my scope in the conditions of last night. However, the description given is of a condensed cluster composed of magnitude 11 to 18 stars. I struggled to make it out in my scope, and it was only after spending time at the EP and gently moving the Dec knob on my mount that I could make the faint cluster out. I used both 18 and 25mm EPs to observe the cluster. However, I had to admit defeat and leave it to the light bucket brigade because I could see nothing more than a very dim view of it. So, to cap off the evening, I decided to point the scope to the Andromeda galaxy as a nice easy target to finish the evening off. I didn't spend much time looking at this, but I was able to see the 3 typical galaxies in the 25mm EP. All in all, a quick but enjoyable session in the backyard. We now have several days of rain and dare I say, possibly snow in the forecast. The forecast into next week is looking slightly better with some possible good conditions in the early part of the week. Fingers crossed for that one! I hate to say it, because every year, the arrival of Christmas sneaks up on me quicker and quicker, but, tonight, the heading of this latest blog post is quite apt. 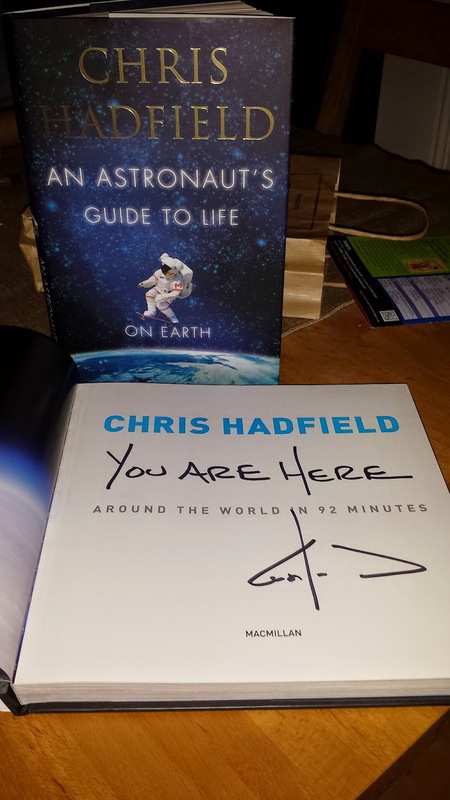 We went to a 'meet the author' event in the Savoy Theater in Monmouth where we listened intently to the author of the two books, You Are Here, Around The World in 92 Minutes and An Astronaut's Guide To Life On Earth. The author in question, Colonel Chris Hadfield. The theater was full, every seat taken by people of all ages. The structure of the talk was quite simple. Prep and countdown to takeoff, getting into space and what to do while you're there before finally, returning to Earth. The talk lasted for around an hour, but the amount of topics covered was massive. His descriptive nature of all the areas was brilliant. To be able to communicate with a wide variety of people on such a level of understanding of the subject matter and maintaining their interest is an art in itself, and it must be said, that as a speaker, he has mastered that art. His explanation and description of the takeoff sequence and launch was brilliant. Not only talking about the technical aspects of launch, the fuel in the rockets, how long each phase lasts for and so forth, but the physical description of what the body goes through during that flight into orbit was brilliant. The finer details of the facts and figures I will leave to the reader of his books and the wealth of information available. However, to hear it first hand, from someone who has experienced it for real, not once, but 3 times, is special. The stories told of what goes on whilst on the ISS give us a small sense of what life is like. The experience of weightlessness and the comfort of sleeping whilst in orbit sounds incredibly relaxing, and the source of some humor apparently too as Chris recalled the sight of people fast asleep, but floating through the ISS because they had fallen asleep before attaching themselves to their sleeping pod wall. In the second part of the talk, he took questions from the floor. Questions such as, 'How hot is the flame that comes out the bottom of the rockets at take off?' 'What's your favourite part of the ISS other than the glass window commonly seen in photos?' were dealt with with ease, humor and interest. However, two of my favourite questions that came from the audience came from two children. The first asked what it was like getting back to Earth and gravity after spending so long in orbit. With the help of another child invited up onto stage, Chris went through the skeleton of the human being describing what is where and why, but then how it all changes and relaxes when in space. It was a good lesson in astro-physiology, if there is such a thing! He spoke about the muscle loss, bone density loss, the weakness of the heart and even down to the softening of the skin on the soles of your feet. Then, he moved on to what happens when you return to Earth and the effects of gravity. The nausea, sickness, tiredness, dizziness and balance problems all explained in simple detail. Perhaps the biggest reaction of the evening, and probably the most impressive response came from the second question. The question was along the lines of, 'What's the most beautiful thing you saw in space?' It was at this point that Chris returned to his laptop to bring up a photo that was truly breathtaking. His description started off by talking about spacewalks, which astronauts need to undertake to maintain and fix external parts of the space station. During a single orbit of the Earth taking 92 minutes, the ISS sees a sunrise and sunset every 45 minutes. It was during one of the periods of darkness that he took the time to switch off all the lights in his space suit so he was in total darkness. Then he changed to the next photo. The ISS was traveling in the Southern Hemisphere, and the photo now on display to the audience was the most stunning picture of the Southern Lights (Aurora Australis) spread under the ISS. The greens were incredibly vivid, and the blues visible in vast curtains of colour. But that wasn't all. The camera picked up alot of the colour, but not all of it. Missing from the photo, but superbly described were the vibrant reds and purples of the aurora as the ISS didn't fly above the aurora, but through it. Incredible. The hour soon flew by and soon, the talk was over. I heard many people say that they could have stayed and listened to him for many more hours. I am indeed one of those people. I also heard one woman say that she learnt more about science in 60 minutes by listening to Chris Hadfield than she did in 7 years of school. That says something. To wrap it all up, he performed an adapted rendition of the Bowie cover that brought him YouTube fame, Space Oddity. I feel privileged to have had the chance to be in the presence of such a human being, and something that I will remember for a very long time. If you get the chance to go, I urge you to do so. You won't regret it. Good evening, and thanks for popping by. Observing chances seem to be slipping me by at the moment. The weather has been cold, calm and clear, but the moon has also been full, large and bright. Unfortunately, it makes DSO observing a bit tricky from an already slightly light polluted location. Nevertheless, it doesn't mean that there is no observing to be done. This past weekend has brought the start of the annual Geminid meteor shower. This is one of, if not, the best meteor showers of the year and happens as the earth passes through the orbit trail of an asteroid by the name of 3200 Phaethon. The trail of dust rock particles left behind from the asteroid provide us with a peak, or Zenith Hourly Rate, of between 100 and 120 meteors an hour overnight on 13th and 14th December. The Geminid meteors characteristically have very bright and long trails which can make for a spectacular display. I remember watching out for them last year whilst on the way home from town one night, and counting about half a dozen or so over a 10 minute period. This year, the moon is quite bright and just past full moon phase. Some of the other meteor showers that we experience would be washed out by the brightness of the moon, but not these. The chances of seeing them are still very very good. The meteor storm is best seen from the Northern Hemisphere where Gemini is quite high in the sky during the night. So, where do we need to look for these meteors as they are burnt up by the Earths atmosphere? Well, contrary to popular belief, they won't happen specifically in one area of the sky. The name Geminid is taken from the area of the sky where the meteors appear to radiate from. That means, the part of the sky which they will appear to be travelling away from. In this case, the radiant of the meteor shower is in the constellation of Gemini. In truth, to see the Geminids, all you need is a clear sky with as good a view as possible all around. To help determine if a meteor is a Geminid, I tend to face the constellation of Gemini, but look pretty much everywhere for meteors shooting away from it. Now all we need is for the weather to be kind. I will spend a bit of time looking this evening, but for the next few days, the forecast for this part of the world is a bit rotten, with a massive low pressure about to broadside the UK from the Atlantic. I hope that this system will all blow through by the weekend and give us at least a couple of quite clear hours and chance to observe. One day, I hope to find the time to look at building a radio detection rig for detecting meteors that can be used even when cloudy. There are plenty of designs and information on how to around the web, It's just a question of time, room and money! Good luck and happy meteor spotting! It's been a little while since I've done any sort of observing from the back garden. But this evening, I thought it would give it a go. At the moment, the moon is fairly full, and due to my wonderfully considerate neighbours, the amount of light pollution in the early evening is quite high. I decided on a lunar session and a bit of a play with some prime focus photography with my Canon 1100d. I must admit, I ended up playing with the camera more than observing. The seeing for the observing was OK, although there was a bit of movement in the movie and view through the eyepiece. However, the result of this play around has prompted me to start looking at using movies or slideshows in my blog. So, to try and accomodate this, I've decided to sign up for a YouTube channel and had a bash at uploading a short video before embedding it in blog posts. It was observing Jim, and just as we know it! To kick off this posting, worthy of mention at this early stage is that last night was the first proper frosty night of this Autumn so far. For some time now, I have been trying to arrange an observing session with my friend Jim but have always been beaten back by weather and availability. However, on Saturday, the forecast for Sunday evening was looking very good. I fired off an email to Jim, and within an hour, he had come back to me. We were all systems go! Our observing site was to be Jims back garden. He lives in a rural location near to the border between England and Wales, and has access to some fantastic dark skies. In the stages of planning a joint observing session together, we decided ideally that we would take into account the phase of the moon, but in truth, I think that anything would suffice other than near full moon conditions. As it happened though, we struck lucky as we were only a day or so past new moon. Part of the idea of a joint observing session was also a chance to compare several scopes at the same time. I took my 150mm reflector, and Jim had his 120mm refractor and finally, the latest to his collection, the 14.5” JLT Dobsonian. There was sufficient room to set up all 3 scopes with plenty of room around them. A wise idea, and a good technique of disaster aversion if you ask me. The last thing you would want would be to hear the clatter of metal and glass come crashing down as one or both of us stumbled into any of the apparatus. So, I turned up at Jims house, and was about to be shown around to the back yard by his wife when this red LED head torch come wandering down the side of the driveway. Jim was already set up with his refractor and on his way. I described the session as a joint observing session with Jim. In truth, I didn’t see Jim as such most of the night. I spent my time talking to the red head torch, and it replied. I assume it was on Jims head and no-one else’s. I had tried to compile a mental list of targets for the evening, but having not observed from the site before, I wasn’t completely sure what restrictions there were other than some trees to the North East. So, I decided to wing it. To observations. We first looked at some popular and easier objects with the intention of comparing the scopes. This was to be the first time that I have looked through a larger aperture reflector than mine, and it was good to be able to do it side by side, on the same object, on the same night. We picked out the Pleides (M45) as the first target. It was rising steadily from the horizon, and our vantage point at around 6.15pm was really quite good. In comparison, the view between the refractor and my reflector was similar I would say. Similar in contrast and the ability to resolve the stars making the target up. When viewed through the dob, we had hoped to make out some nebulosity, but this wasn’t to be. Even with the 14.5” mirror. This might have been due to it’s comparatively low position at the time of viewing. Nevertheless, there was an abundance of stars in the view finder, many of which I couldn’t pick out with the 150mm. From there, we went onto the Ring Nebula (M57) in Lyra. At magnitude 8.8, it’s well within the ability of both scopes, and a target I have visited often. We both found the target quite quickly, and using averted vision I was just able to begin to make out the darker central areas to the nebula that gives it the characteristic ring shape. Through the dob, we were able to view at a higher magnification. The target wasn’t particularly filling the eyepiece, but the greater light gathering power of the dob meant that the ring was much more apparent. I was also able to resolve the single star to the edge of the nebula, often caught in photos. However, I couldn’t see anything that could have been the star in the centre of the ring. Whilst in the area of sky directly above us, we decided to move onto the Dumbbell Nebula (M27). This is an object that I have viewed from quite a few locations, and at different phases of the moon. These were undoubtedly the best conditions over the last year that I viewed it in. Through the 150mm I could see the nebula quite clearly, but regardless of the magnifications and time at the EP, I couldn’t be sure of verifying any structure. However, Jim had found the target, and at a greater magnification, we could both make out distinctive ‘bites’ take out of the circular shape of the nebula which gives it the ‘Dumbbell’ name. Another big tick to the dob! Whilst searching in the sky charts for a next worthy target, I noticed how damp things were getting. Even more so when looking through the Telrad. Sadly, my home made Telrad dew shield wasn’t quite doing its job. I can confirm that as good a bit of kit as my Telrad is, it possesses a mysterious dew attractant field around it. It might need a bit of a re-design on that front. So, to the next target in the constellation of Sagitta. I last visited M71 back in July in Summer conditions. It was the first globular cluster of the evening, and at magnitude 6.1 it stood out very well against the background of the autumnal sky through my 150mm reflector. Unfortunately, we didn’t look through neither of the other scopes at this cluster. Jim was trying to locate Uranus, drink hot chocolate and eat cookies at the time. I can fully understand the effort this was taking and was quite happy to show the target in my reflector before then moving on to the next object. M33, or Triangulum galaxy is a magnitude 5.7 spiral galaxy and is reasonably large. The interesting thing with comparing the view of this galaxy in each scope, was that the extra aperture of the larger dob didn’t seem to bring out much more detail. Although later at a larger magnification through the dob Jim may have started to make out some of the darker areas between some of the spiral arms of the galaxy. A short hop to Andromeda, and another batch of favourites for many. Conditions were cooling down rapidly, and frost was forming readily on most surfaces around us, but the seeing conditions were excellent. This give rise to the first of two ‘firsts’ for me. I’d never appreciated the visibility of Andromeda to the naked eye. Generally, when I have viewed it in the past, it’s been lower on the horizon and certainly to the naked eye, washed out. However the conditions on the clear moonless night meant that we could see the galaxy quite clearly. Although, using the Telrad to get it lined up in the scope was almost impossible because of the afore mentioned dew on the glass. I persevered. I got there in the end. The view, as was expected, filled the EP of the 150mm and I could easily make out the nearby M110. However, I was always aware of the existence of M32 in the locality but couldn’t identify it in the 150mm. Through the 14.5” dob though, it was resolved with ease. Going back to the 150mm with the image of from the dob in my mind, I was then also able to positively id the location of M32 in amongst the rest of Andromeda. This positive id meant that I could confirm the sighting and not assume that a small lighter smudge was the target as I have had to do before. Another good tick for the dob! It was time to move on and when asked by Jim for a suggestion to another target, I happened to be looking at the page on the sky atlas that showed an object NGC 7662. It’s an object that I hadn’t come across before, and was labelled as the Blue Snowball Nebula in the constellation of Andromeda. I certainly knew I hadn’t observed this target before, and Jim couldn’t recollect it. Given that, we had no visual expectations of what the target looked like, how big it was, or an idea of it’s magnitude, we decided to go for it anyway. Locating using the Telrad should have been very easy. I spent quite a few minutes tracking down the area in the sky where it should have been observable. I was using the 25mm EP. However, Jim was also scanning the same area of sky unaided at first. It might have been at this point his red dot finder sprung into life. Nevertheless, he claimed the success of the first observation. Because of its altitude in the sky (being quite close to zenith), it was time to break out the step ladder! Up until now, it was necessary for me to stand tip toes on a small step. Jim being taller than me was able to observe most targets comfortably. But, even Jim had to resort to the stepladder for this one. My first view through the dobs viewfinder was fantastic. A brilliant blue circular nebula pitched against a very black background surrounded by several small stars. It's magnitude is 8.6 and the object itself is quite small. This was the reason why I had not picked it up initially. I had observed the object, but only at low magnification. I changed to my 8mm EP and then picked it up straight away. It’s a fantastic and beautiful object and certainly for me, the target of the night. I would love to show this one off to someone else in the future. The evening was progressing, and as always, when you’re enjoying yourself, time moves quickly. It was almost time for me to leave, but we chose to squeeze in a couple more targets for the night. We moved our scopes around to the constellation of Auriga and quickly picked out M36 and M38. 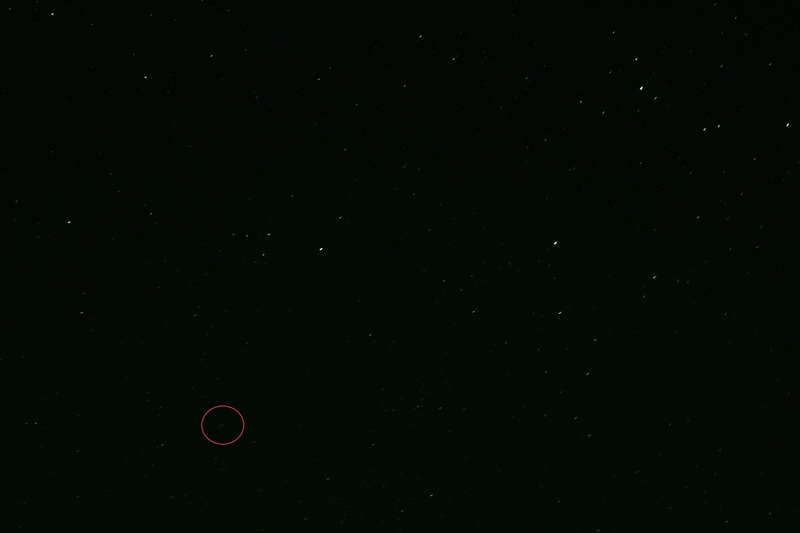 Both open clusters, with M38 being the slightly dimmer of the two at magnitude 7.4. Both these clusters were well populated, but with not much time left, we had no time to properly compare the views through the various scopes. 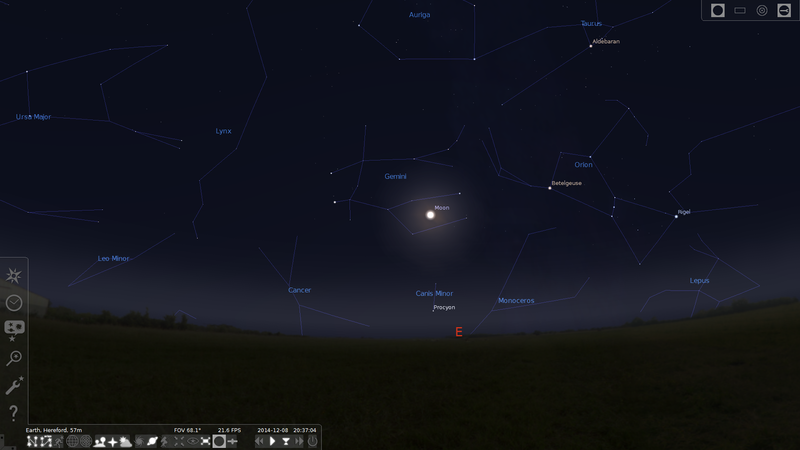 However, looking at Auriga in the sky atlas, it certainly is an area of the sky that I want to spend an evening on. We started to pack up by around 9.30pm rather begrudgingly. The conditions remained stable all evening, and there didn’t seem to be any deterioration in seeing. The forecast for the rest of the evening was for fog to come in late at night and in the early hours which just made me want to stay out to eek out the last of the good conditions, but it was time to go home. So, to summarise, aperture is important, as is focal length. A larger scope in some ways does help to see more. Comparison showed though that it doesn’t always work like that, but more often than not, aperture fever and telescope envy happens for good reason! Our list of targets for the night give a mix of the popular and first timers. It’s given me some more ideas of areas to observe and work on in the future, but also reaffirms my thoughts on the worth of revisiting traditional favourites. There’s always something new to see. Winter has most certainly arrived in Ross Vegas, and the cold dark nights have imposed themselves upon us for what I hope will be an excellent winter of observing. The darker evenings give us working mortals more chance to set up a scope for a session, and still get to bed as a reasonable time on a school night. Providing the weather plays ball of course! Recently, I’ve been speaking to several people in reference to observing sessions, and how I decide what to observe in a session. Of course, there are a vast amount of targets available to go after. Some of them are arranged in catalogues, such as the famous Messier catalogue, and then there are the planetary targets in our solar system and the various moons associated with them. All these things provide a vast list of things to go at. In this blog entry, I will attempt to describe how I plan my observing sessions and how I have found to get the best out of them. I don’t think that there is a definitive right or wrong way to go about this and in my short time as an amateur observer and stargazer, I’m always on the lookout for help and advice from other members of the astronomy community who have a lifetime more experience than me. So, let’s begin. Observing sessions for me usually last in the 2 to 3 hour range, longer on weekends. As well as time and visibility, I also find that the temperature and dew can restrict the time I spend at the eyepiece. Without the various dew shields and straps that can be bought for telescopes, after a while, dew and frost will ultimately win and often dictates the end of the session. So, it’s important to be prepared. My preparation for a session usually starts on the days leading up to the time when I go out. The first consideration I make is the time of year. 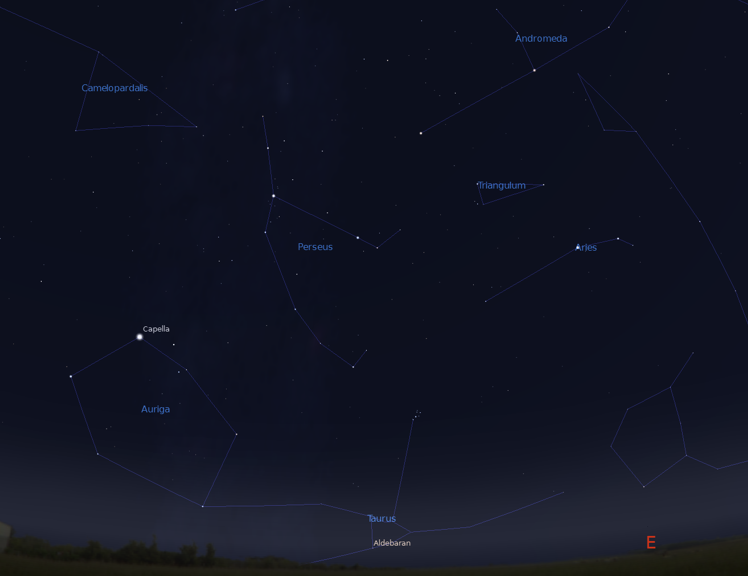 As any budding enthusiast will tell you, the time of year will determine what is available in the night sky to be observed due to the seasonal skies around us. Any good star atlas, or chart will be able to tell you what is visible at different times of the night for any period of the year. I also refer to forums such as Stargazers Lounge, magazines such as Astronomy Now, and The Sky At Night and TV programmes to find out about any unusual or rare objects that can be observed. A recent example of such an object was C2/2014 E2 Jacques. Usually, the rare objects will take some sort of precedence on the plan. The next consideration I make, or rather, the next decision I make, tends to be to choose a specific area of the sky to work with for the evening. Usually, I will chose a specific constellation or two, or depending on the moon phase, plan a lunar observing session. I have to bear in mind where my observing is going to be completed from. For instance, if I go back yard observing, then there are several impediments to my view of the night sky such as buildings. If I am to observe from somewhere else, I will usually have an idea of the views to horizons and take these into consideration. 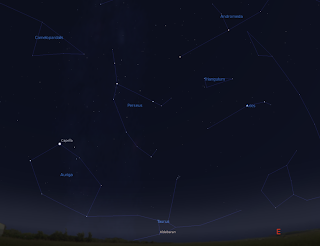 Now is the time to reach for a more detailed star atlas, or programme such as Stellarium. It’s time to do a bit of research. Like most people, when you have used a specific telescope for any amount of time, you get to know its limiting factors, especially its limiting magnitude in given conditions. I refer to an atlas and pick out objects that I think that I will be able to view with my scope. This can mean a bit of time online too, in order to get the correct magnitudes. Time can be quite precious, so I don’t really want to be stuck trying to find an object with a magnitude so dim that it is beyond the capability of my scope and eyepieces. When lunar observing, knowing what parts of the lunar surface are going to be visible is important, as well as the times for moonrise and moonset. Usually, I’ll note down around 6 to 8 targets of varying magnitude to give me a good spread of targets to look for. I will also try to familiarise myself with their respective locations amongst the constellations to make navigating to them an easier task. I find that by keeping a potential target list at this sort of length for an evening’s observing is ample to get on with. When I first started, I used to find myself rushing around the sky trying to seek out as many targets as I possibly could. They are exciting times indeed, but I have since slowed my observing pace down a little. I now spend much more time on an individual target and allow myself the opportunity to explore it fully, to tease out as much detail as possible using a selection of eyepieces. If my research before the session suggests that a target is better viewed with a specific filter, then I will make sure I take the time to use that filter if I have it and compare the images I see. I have learned that it isn’t important to achieve everything on the intended list for the night. If I only end up seeing 1, 2 or 3 targets on the list for that session, then so be it. There will always be another time to go back and tick them off again at a later date. I like to record what I see and when. Indeed, a large part of this blog is given over to my observational records. I also have a field notebook which comes outside with me, and is with me when I plan what to see. It’s also got plenty of scribbles and notes on anything astronomy related that I might one day want to refer back to. And finally, I also have a book solely for observations. As much as I use and embrace IT, computers and the internet, there is no guarantee that all my observing records are always going to be available to me online for the rest of my days. And finally, another lesson that I’ve learnt is that you soon get some favourite targets that you find yourself drawn to time and again. Typically, things like M31, the Andromeda Galaxy, the Double Cluster in Perseus and M57, the Ring Nebula in Lyra. Not to mention the giant planets Saturn and Jupiter. I’m drawn to these for a reason, whatever that might be. It’s important for whatever that reason might be, that I spend time re-visiting them. As they are favourites, they tend to be easy to locate the 4th, 8th 10th or whatever time, and it’s always a nice way to end a session by re-visiting one, or some of these targets. 1. Research what’s available for the time of year. 2. Research any special or rare targets observable at the time. 3. Consider the observing site you intend to use and account for any viewing restrictions in place. 4. Focus on one or two constellations, a lunar, or a planetary session. 5. List between 6 and 8 achievable targets in your chosen area. 6. Take your time on each target and experiment with all available options to get the best views. 7. Don’t rush to tick off all the targets in a single session. If you miss some out, they will usually be around next time. 8. Revisit at least one favourite from previous sessions. 9. Note the observations and record. 10. If there targets remaining on the list at the end of the session, use them on the next target list. A little bit more on the Sydney Observatory. A couple of weeks ago, I mentioned briefly about my first observing experience in the Southern Hemisphere. 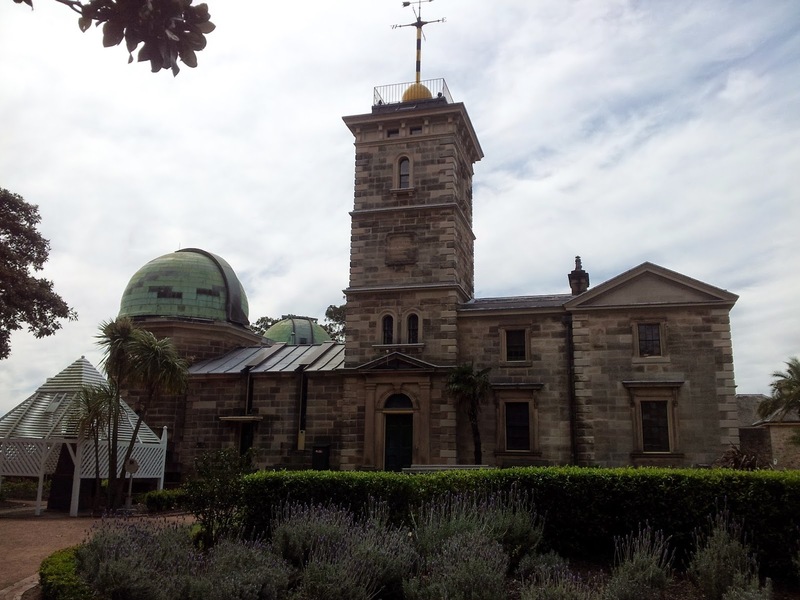 However, I didn't go into much detail about our short visit to the Sydney Observatory. The observatory is situated, pride of place on top of the hill in The Rocks area of the city, just next to the harbour bridge. The observatory was built in 1858, back when the city was still very young, and light pollution was not an issue. These days though, with the lights from all the different harbours, and the city itself, naked eye observing is a tough as it is in any other major built up area of the world. Nevertheless, the building has been maintained and run with astronomy and education in mind. There are two large copper domes attached to the main building of the observatory, and many other rooms throughout the building. The observatory is mostly free to visit and walk around. There are many exhibits on display, some of which are interactive, and many of historical note. 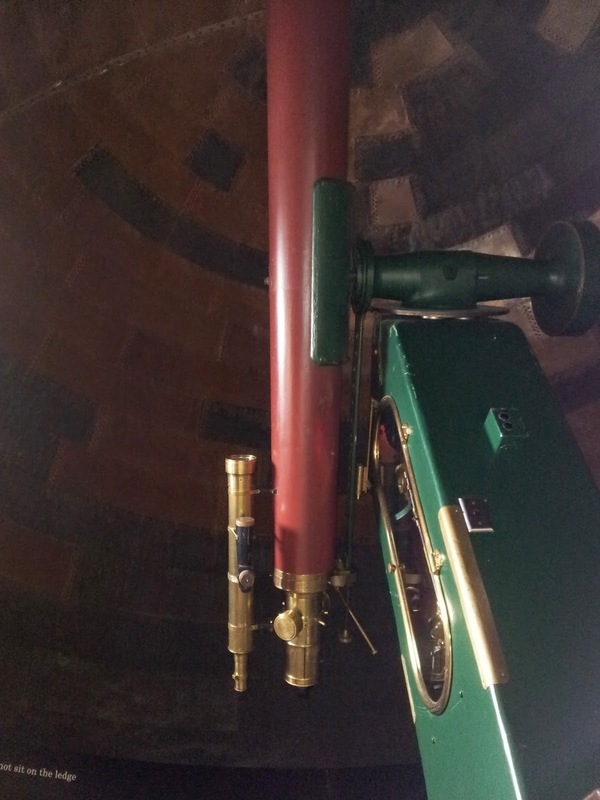 The 1874 Hugo Schroeder refractor. On display, and available to use, in the South dome is a 11.4" refractor telescope on an equatorial mount. It was built by Hugo Schroeder in 1874 and is found being held up into the dome by a massive stone and concrete pillar of around 1 meter square and around 3 stories high. This is the oldest working telescope in Australia. In the North dome, a more modern telescope can be found. This wasn't available for viewing during our visit as there was already a pre-booked group in the dome with it at the time, but it is a 400mm Schmidt Cassegrain scope used for imaging. The North dome also accommodates a scope used for solar viewing. Another interesting scope exhibited in the observatory is the Transit Circle telescope. This scope is only able to move on a North - South axis, and therfore is extremely accurate at telling the time! On certain parts of the sky are available at any point during the day or night. However, this looks like it is purely an exhibit these days and is no longer used. There were building works going on in the ground of the observatory while we were there. From what we could understand, a 3rd telescope dome is in the process of being built, but this time being specially designed for disabled user access. It will be interesting to see how this looks when it is finished. Booked in for AstroCamp 2014. Since coming back from holidays, everything's been a bit of a whirlwind and since the last astro blog entry, excitement has been mounting for the coming months of dark winter nights. I've been told that I'm weird and odd by several people over the Summer because I've been looking forward to the dark winter nights. I expect I'm not the only amateur observer that's been told the same thing. So, with the credit card straining under the pressure of holiday spend, it's taking a huge amount of restraint not to go off on one and spend on loads of new astro kit for this winter. Nevertheless, I now have something astro related to look forward to. I've just booked in for AstroCamp in May 2015. I've been to an SGL star party as a visitor for a single night as the venue for that isn't very far away, but this will be my first full on star party. It's being held on a campsite in the village of Cwmdu, near Brecon in South Wales, and I can't wait. I am also keeping an eye out for the dates and bookings to open for SGL 10, the star party organised by the people who run the Stargazers Lounge astronomy forum. Fingers crossed, I will be able to get to that one too. In 6 months time, I'll be pitched up in Cwmdu with a bunch of other like-minded people. The question is, will I have actually purchased my next scope by then? I hope so. The Dob. brigade is beckoning, and aperture fever is rife! The credit card needs to be relieved of some strain before then though. I've just returned from holidays in Australia and an opportunity for some southern hemisphere observing, which is a first for me. The main blog for the holiday can be found here but for the astro specific observations, read on! On the whole, there were few true observing opportunities either down to weather, or just not having a sensible scope or binoculars with me. However, I had taken my Sky and Telescope Pocket Atlas with me, and one evening whilst parked up in the camper van, I had a chance to sit outside and start to familiarise myself with the constellations and stars of the southern climbs. During that evening, once my night vision was as good as it was going to get in the local conditions, I thought I was able to make out an open cluster in Scorpius. After a little while longer of staring and referring to the star atlas, I determined that I was actually looking at M7. The only optics I had with me were a small pair of pocket binoculars, so they would have to do. Nevertheless, they were enough to bring out the cluster quite nicely. Whilst observing in that area of the sky, I also came across another cluster that I then determined to be M6, The Butterfly Cluster. I was very pleased to be able to tick off these Messier objects as first views. Later in the holiday, we found ourselves on Kangaroo Island. This is a very sparsely populated corner of South Australia. Most of the island is given to agriculture, national parks and wildlife reserves. We were in quite a remote cabin with almost 360 horizon views all around with the exception of a tree and our cabin. We had one observable night here, although we had a lot of disruption of banks of passing cloud. Fortunately, the wind was pushing them through quite rapidly. We made several observations, again re-visiting M6 and M7, but also naked eye views of the SMC and LMC. I took the chance to take some photographs in between cloud breaks. The LMC and SMC can be made out in this wide view photo. A shot of the Milky way as seen in the southern hemisphere. Unfortunately, we were always up against it with the cloud!